This DK weight garter and lace shawl will look great with your fall wardrobe. 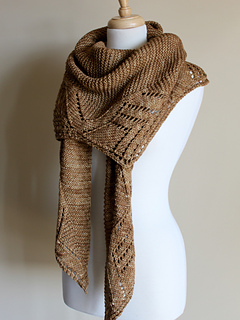 The long length gives it versatility, style, and warmth. 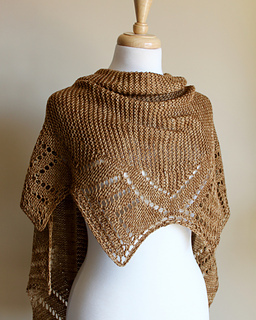 The sideways construction makes it quick and easy to knit and the lace edge is worked along with the body. Any amount of yarn may be used. 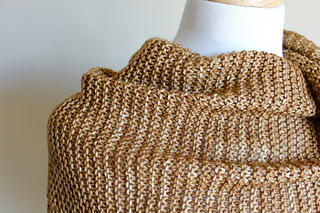 Three full skeins of Madelinetosh Tosh DK are used here (shown in Sand Dune). 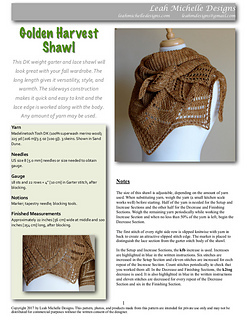 Pattern includes notes, diagram, list of abbreviations, and the stitch pattern is both written and charted. 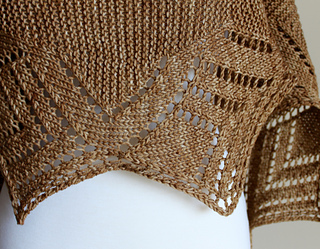 Finished measurements: Approximately 22 inches (56 cm) wide at middle and 100 inches (254 cm) long, after blocking. 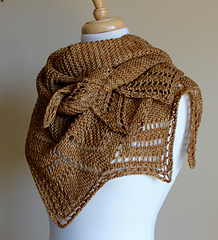 Skills required: increasing, decreasing, knitting lace, blocking lace. Stitches used: k, p, yo, ssk, kfb, k2tog, SK2P.